This article was written By Rex Baylon on 07 Sep 2013, and is filed under Reviews. Romance, like any well-established genre, has several well-known tropes that must always be followed. Clichés usually involve a man and woman accidentally bumping into each other, the man pursuing the woman even if she happens to be engaged to someone else, and a third act climax where the male protagonist musters up all his strength and professes his love to the pretty female lead and drags her away to live a supposedly happy life together. Reality never lives up to fantasy, though. The unknown variables of life and the simple fact that those in relationships don’t have the luxury of a fade-out right before life gets too hard make “happy endings” a rare commodity. In Jerrold Tarog’s Sana Dati (2013), which premiered at this year”s Cinemalaya Festival, the film isn’t hampered by the need to have the “happy ending”, though the tropes of the romance genre are respected. Instead, Sana Dati is a naturalistic story about what happens after a relationship has ended, and the emotional struggle that goes with re-committing one’s heart to another person again. Unlike many forgettable and downright insulting romantic dramas and comedies, Sana Dati isn’t a tearjerker, even as Tarog imbues the entire film with a bittersweet air. Opening on a quote by Voltaire, “Doubt is not a pleasant condition, but certainty is absurd”, the film begins in an empty store, devoid of furniture, merchandise, or people. A man enters followed by a woman. From the dialogue, we learn that the two are a couple and that they’ve bought the place. They are happy and the young woman discovers a pleasant surprise left by her boyfriend, a rose in a vase and an engagement ring. The scene ends with the woman looking at the camera toward her boyfriend and giving us a big smile. After that opening, we get a series of short scenes of a videographer going to a hotel to film a couple getting married. Our expectations are that the couple at the start is tying the knot, but as the story unfolds, we learn that the young man, Andrew (Benjamin Alves), is dead and that Andrea (Lovi Poe), his ex-girlfriend, is now with a different man. Tarog’s film, just as much of a detective story as it is a romance, presents the beginning and end of that opening couple”s relationship through a series of unedited video clips and flashbacks. The videographer Dennis (Paulo Avelino), the audience surrogate, who has a connection to Andrew, acts like a detective investigating the films requisite femme fatale. The crux of the story is the familiar trope of the woman, Andrea, having to choose which man she will be with. Of course, the twist is that she must either choose to be with her dead ex or tie the knot with a man that is still very much a stranger to her. The contrast between Andrew and Andrea’s relationship and Andrea’s impending marriage to her fiancé played by TJ Trinidad online casino can’t easily be boiled down to who is the “better” man. All these people are damaged, physically and emotionally, yet Andrea can’t escape the responsibility of having to choose between her joyful past and unknown future. Whereas Hollywood love stories cling onto antiquated notions of the “one true love” Tarog eschews such juvenile notions. 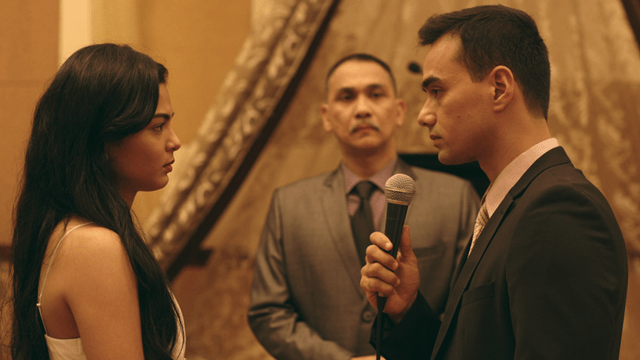 Lovi Poe portrays Andrea as a woman who is painfully alone yet is apprehensive about betraying Andrew for another man. The conflict going on in her heart and mind is so eloquently portrayed by her, it’s impossible to imagine what the right choice is in her situation. Sana Dati might, from my description, appear oppressively dark or bleak, but it is nothing of the sort. Whereas typical melodramas milk the sad moments for all the tears they can, Sana Dati’s voyeuristic visual style never lingers too long on a scene. We get impressions of these characters and their pain, but Tarog never exploits the moment and the cinematographer Mackie Galvez gives the film a gauzy romantic look even as the story turns tragic. It seems that since the start of the new millennium the romance genre, at least the not-so mainstream entries, have evolved to be more contemplative and have striven to portray situations that are more emotionally realistic. Sana Dati deserves a place in that canon alongside Richard Linklater’s Before trilogy and the talky dramas of Eric Rohmer. Foregoing big emotional scenes, a requisite villain, or even a conclusive ending it’s not so hard to imagine the story continuing on, the characters going about their lives in a constant cycle of pain and happiness.